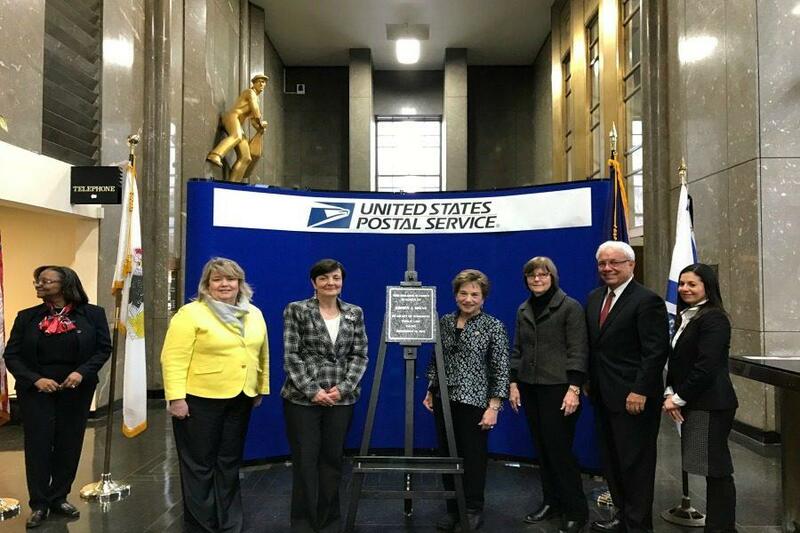 Postal officials, family members and local politicians stand in front of a plague dedicated to the late progressive icon, Abner Mikva. More than 70 people gathered Monday to honor Mikva, who once represented Evanston in Congress. Local officials and community members gathered Monday morning to dedicate the Evanston Post Office on Davis Street to Abner Mikva, the late progressive politician and former federal judge who once represented the city’s district in Congress. After Mikva died in July, U.S. Rep. Jan Schakowsky (D-Evanston) introduced a bill to rename the building. On Monday, more than 70 people gathered at the post office to honor the liberal icon, who championed justice reform and gun control. “(Mikva) brought humility, integrity and fairness to every challenge he faced and combined those qualities with an extraordinary sense of humor and a famous ability to get along with others — regardless of their politics,” Durbin said in a statement. Mikva served in all three branches of government during his life. In 1956, he started off in the Illinois General Assembly where he served five consecutive terms and sponsored legislation for fair employment practices and open housing. From there he moved on to represent the Hyde Park area. Then, in 1974 Mikva won a seat to represent Illinois’ 10th congressional district, which at the time included Evanston. Schakowsky said Mikva was an “indispensable” mentor and role model who inspired her to enter politics. Mikva also served as chief judge of the United States Court of Appeals for the District of Columbia, White House counsel to Bill Clinton and a professor at both Northwestern and University of Chicago law schools. While serving as a judge, he gained notoriety for a 1993 decision to strike down a ban on gay people serving in the U.S. military. In 2014, Mikva received the Presidential Medal of Freedom, the highest award available to U.S. civilians. Speaking at the medal ceremony, former President Barack Obama said Mikva had dedicated his life to public service. On Monday, his daughter Mary Mikva — a judge in the Circuit Court of Cook County — said the post office would cement her father’s legacy in Evanston. She added that the dedication represented a “perfect” combination of three things he loved: Congress, Evanston and letters.